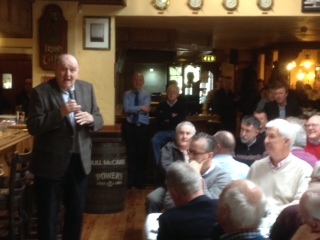 On Saturday 21st February, rugby pundit and broadcaster George Hook was the guest speaker at the Lent Men’s Breakfast held in Douglas. This event, which was the second of its kind held in the parish, filled Bull McCabes bar on the Airport Road in Cork to capacity. George Hook is well known for his forthright style on radio and television. In his talk, he touched on a theme which he recently aired with Brendan O’Connor on RTE’s The Saturday Night Show. He described how he has come to a new appreciation of his Christian faith and of how that faith motivates him in life. In a light-hearted speech, he also shared some anecdotes about growing up in Cork and his predictions for the Irish Rugby Team in this year’s Six Nations Championship. Bull McCabes, is owned by the Dunne family who are very involved in the life of the parish. 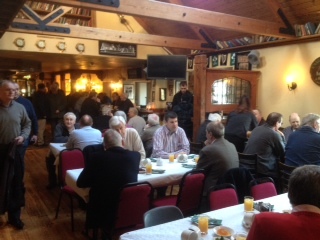 They opened their premises earlier than normal, to host and cater for this breakfast event. 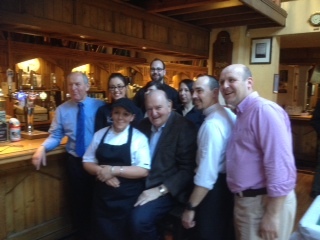 George Hook shares a joke with staff at the Bull McCabe’s Bar after the Douglas Union with Frankfield Men’s Breakfast at the start of Lent. This entry was posted in Diocese, Lent, Parish News, People from the Diocese, Social Events, Special Events. Bookmark the permalink.